Children in Yemen are teetering between life and death, as 2.2 million suffer from acute malnutrition, while those killed by hostilities jumped 70 percent last year, UNICEF warned on the second anniversary of the war in the Middle East’s poorest country. Nearly half a million children suffer from severe acute malnutrition, which is manifest in grotesquely slim bodies and stunted growth – a 200-percent increase since 2014, the report warned. The fighting and devastation has forced Yemenis into buying cheaper food or skipping meals, while around 80 percent of families are in debt or borrowing money just to feed their children. UNIECF, which is now spearheading relief efforts in Yemen, said nearly 2.2 million children are currently acutely malnourished and require urgent care. Children suffering from severe acute malnutrition are ten times more likely to die than their healthy peers because their weakened immune systems leave them vulnerable to diseases. Consequently, UNICEF has classified them as having a life-threatening condition. 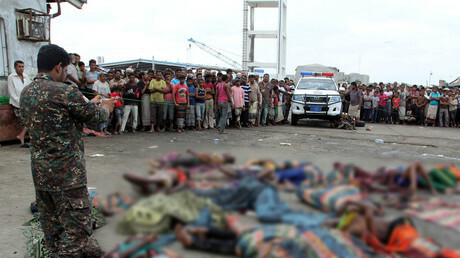 Apart from deaths caused directly by fighting, UNICEF cited previous UN estimates warning that at least one Yemeni child dies of “preventable causes like malnutrition, diarrhea, and respiratory tract infections” every 10 minutes, as the country is gradually turning into one of the largest food and malnutrition emergencies in the world. “Cemeteries are filling up with small unmarked graves, the deaths of children unreported to authorities, their suffering invisible to the world,” the UN agency warned. 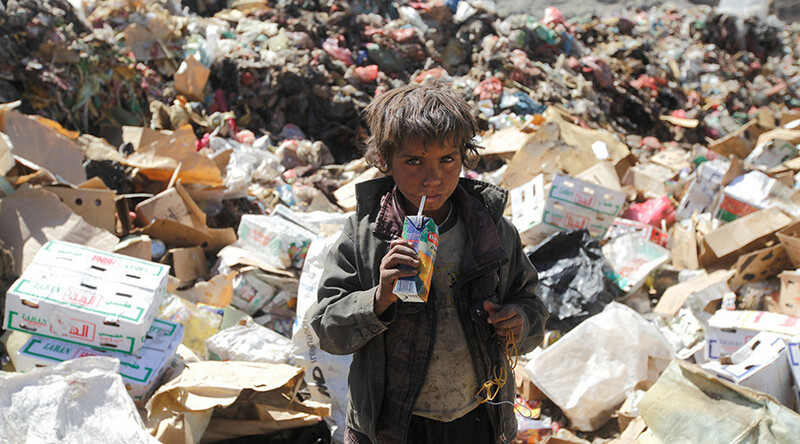 The Yemen war, which broke out in 2015 after Saudi Arabia led an intervention to restore ousted Abd Rabbuh Mansour Hadi to power, has so far claimed the lives of 1,546 children, according to the UNICEF report. The appalling figure adds to the 2,450 children maimed and 235 abducted during the hostilities, while 1,572 children have been recruited as child soldiers to join the fighting. The hardships that come with war have compelled millions of families across the country to resort to “negative coping mechanisms.” Parents have married off about 44.5 percent of girls under age 15 to be relieved of the cost of caring for them, or to secure better protection from a husband’s family. Underage marriages are widespread in the Al Hudaydah, Hajjah, and Ibb governorates, where there are large numbers of displaced people. Since the beginning of the Saudi-led intervention, rights groups such as Human Rights Watch have documented dozens of instances of “apparently unlawful coalition airstrikes, some of which may amount to war crimes,” which have killed nearly 900 civilians. HRW has also recorded seven indiscriminate attacks by Houthi forces, but the warring parties carry on fighting despite the rising civilian death toll. “The war in Yemen continues to claim children’s lives and their future,” said Meritxell Relano, UNICEF’s representative in Yemen. “Relentless fighting and destruction has scarred children for life. Families have been left destitute and are struggling to cope,” he said. In many cases, it is members of the Saudi-led coalition that prevent aid agencies like Oxfam from delivering aid to those in need, Stanforth said. “Some of the international backers of the Saudi-led coalition have been blockading the country, they’ve been stopping food and other supplies from getting into Yemen’s ports,” he added.